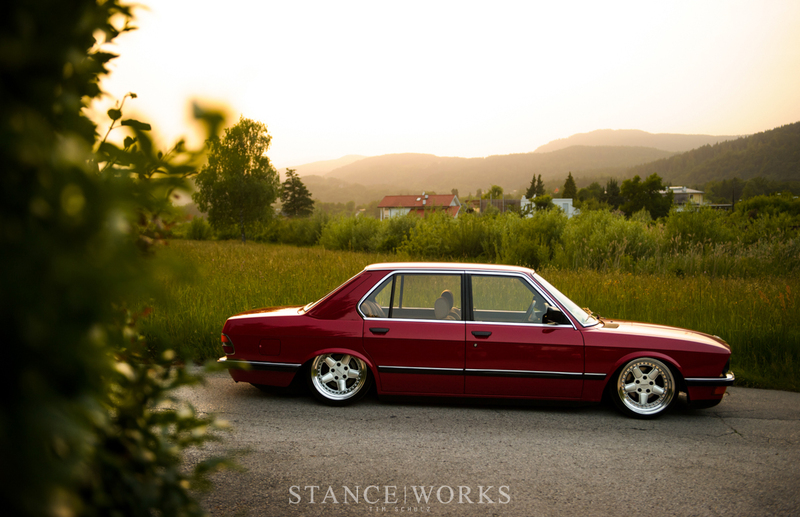 After a tour through Italy in an E28, a stock, red one no less, I found my inner "old man" starting to show. For the first time in my life, I've had the passing though of "now I can understand how these old men prefer their cars stock. It doesn't need to be changed." Luckily, it's a fleeting thought, and I am constantly reminded that there is something truly special about modified cars and their inherent sense of self-expression. While the E28 in its factory essence is in no need of change, it doesn't mean that change isn't welcome. 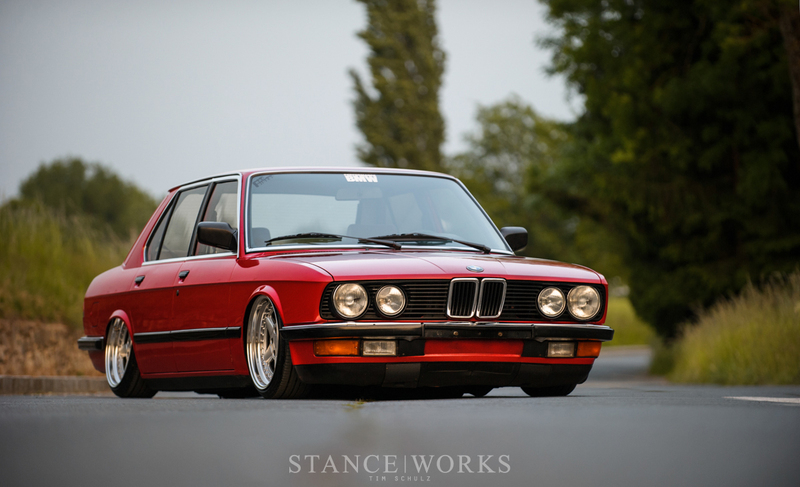 Such a thought presented the perfect opportunity - it seemed only fair to follow up one red E28 with another. Elmar den Exter's 1986 520i is, in many ways, the polar opposite of last week's purist delight. Starting with the subtleties, it's not an M5. In contrast to the M88's 282 horsepower, Elmar's 2.0-liter M20 pumps out just over 120 ponies. The exterior detail work, to those with sharp eyes, is different too; the lack of a chin and rear deck spoiler hint at Elmar's "entry" level options, and while the lack of "shadowline" trim is technically a downside, it does favors for the build. 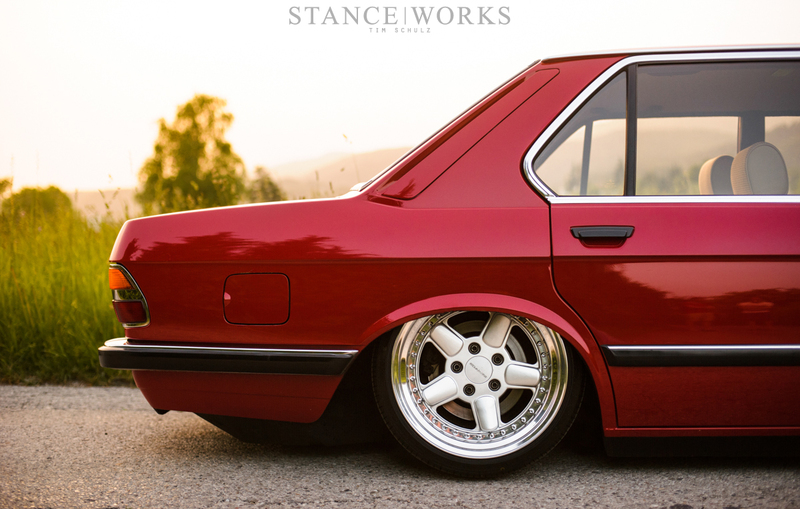 While they're both bright red - one of the best color choices for an E28, period - the contrasting interior differences lend a different overall tone to each respective car. However, that's where the subtleties end. There's one immediately obvious difference: Elmar's car is lower. Much, much lower, and that's exactly what Elmar wants. In many ways, it's the entire point: it doesn't take much more, in reality, to separate Elmar's car from the run-of-the-mill, albeit beautiful styling BMW offered from the factory. 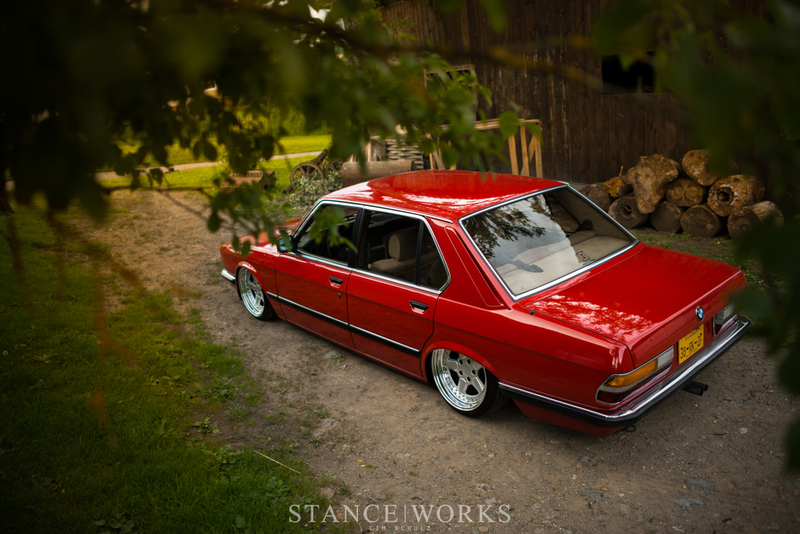 The lines are untouched, as is the essence of the car, however, its planted firmly on the ground, rocketing the red sedan to the forefront of Worthersee's attractive BMWs for 2014. 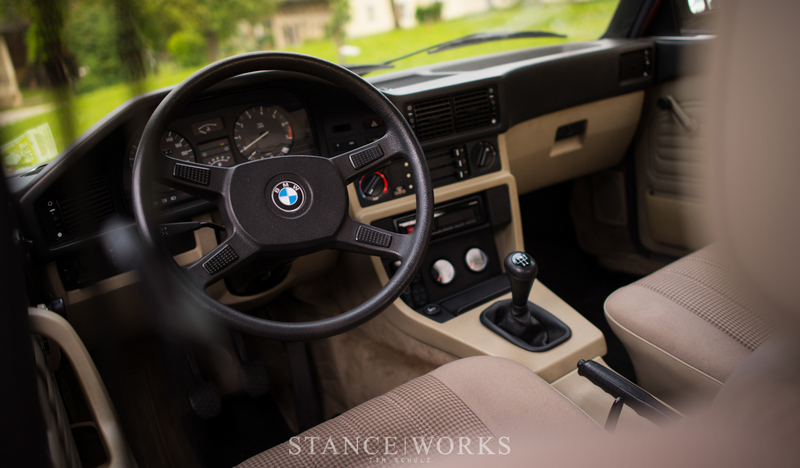 Much of what I fell in love with about the E28 M5 has only been built upon, personalized, and embraced. 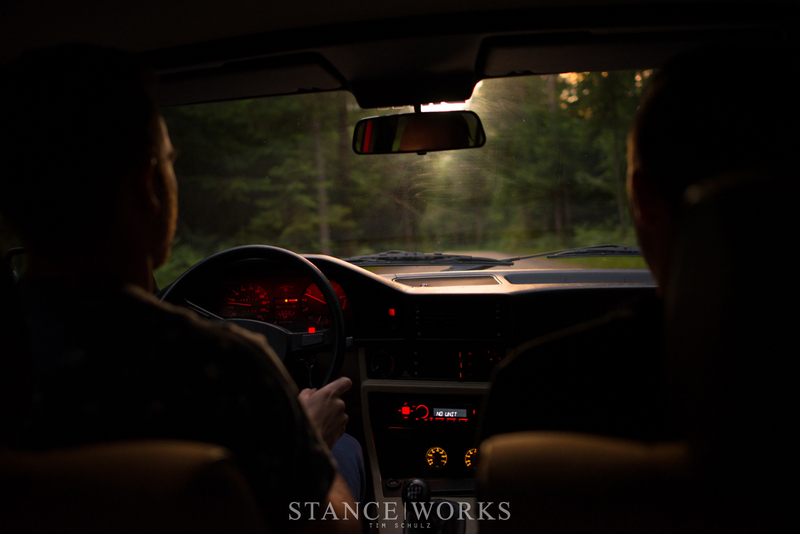 Whether you're a fan of the stock stance, the way Elmar's creation sits, or somewhere in between, Elmar has done well in creating a wonderfully complimentary, yet opposing car: slow and steady versus willing and ready. After spending extensive time on coilovers and stock Corvette wheels, Elmar knew exactly what was needed to take the car from lacking at best, to a true attention-getter. In place of the old coils and allowing the newfound low-slung height of the E28 is a set of Air Lift Universal air struts, with E46 McPherson units replacing the factory housings after some modifications. In the rear, a standard set of universal sleeve-bag struts were cut to length and fitted to the car. Tucked under all four arches is a set of AC-Schnitzer Type 1s, measuring out to 17x8.5 on all four corners. The wheel itself aids to my point - a perfect balance between OEM and a truly personalized aftermarket styling choice - the wheel could be either one. In all, Elmar's E28 is clean, simple, and beautiful - and I found it impossible not to follow up our Italian tour with such a similar, yet different car. High or low, wild or tame, it's hard for me to turn away from the 2nd-generation 5-series. The only problem? The more of these European cars I see, the more angry I become with BMW for giving us the ugly step-child version. Thanks a lot, BMW. This is clean! This sits so right and the paint is immaculate! Nice build! Thanks a lot, USA Crash Regulations. So beautiful but could you at least feature one image at driving height.. I’m sure it’s still low enough to look better than stock and less like the rear axle broke in half. any chance of sharing the paint code? love it. الى شركة تنظيف منازل لا تتردد فى استعمال شركتنا الشركة الاولى فى تنظيف المنازل . فى وقت قياسى و هذا لاننا نستخدم افضل مواد التنظيف التى تستخدم فى تنظيف فلل و التى تستخدمها شركات https://www.qasr-ksa.com/%d8%aa%d9%86%d8%b8%d9%8a%d9%81-%d9%81%d9%84%d9%84-%d8%a8%d8%a7%d9%84%d8%b1%d9%8a%d8%a7%d8%b6/ لذا ان كنت تحتاج الى تنظيف الفلل لديك لا تتردد فى الاتصال بشركتنا بشركة قصر المملكة افضل شركة للخدمات المتاكاملة بالرياض . موكيت منزلك لا تترد فى الاتصال بشركتنا شركة قصر المملكة https://www.qasr-ksa.com/ بالرياض افضل شركة تنظيف على مستوى الرياض .